Our full service installation teams have years of experience in safely transporting, un-packing, and setting up your office. 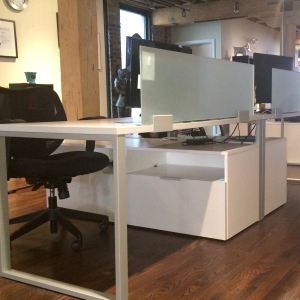 We will happily provide a quote for your office furniture delivery and/or installation needs. Our professional delivery team and office furniture installers can help your company follow the office space design plan you have. Our office furniture delivery teams can set up desks, cubicles, conference rooms, assemble chairs, assemble storage cabinets, and more. Office furniture can be extremely heavy and have fragile pieces such as glass plate dividers or tabletops. So please let our team deliver and install your office furniture for you, so you know it's done safely and properly. If you need help with your office space design plan before your office furniture delivery, please contact us today for more information.